Interesting to me because of the North Dakota connection and I’ve also read a fair amount about the Indians of North America since college days (many moons ago). . This history begins with the author’s personal travels in central North Dakota in the early 21st century. Then she gets into the geography and natural progression of their migration to the North Dakota area, their myths, housing, hunting, agriculture and wars. Then come the effects of the European incursion starting with a guy named La Vérendrye and his sons and a few other lone traders to trade with other native groups for horses and guns. A great deal of the material concerns the exploring and voyaging of the traders. This is necessary because other than archeological evidence, where do we get our information about pre-literate peoples? 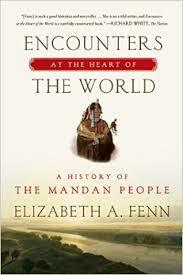 There are a few sources which are based on interviews with surviving Mandan people but not very many at all – 2 or 3? This is almost a Canadian history as well as an American one because the Mandan country was accessible from the Hudson Bay companies as well as the French forts. Also many of the traders came from the north. But by the time Lewis & Clark reached the area the area was part of the United States and they were surveying for the government, cataloguing their sightings, trading, and looking for the Northwest Passage. Nutrition is discussed and then more trading, medical issues, drought and famine. Finally there are the steamboats coming up the Missouri River taking out more trees, bringing in more pestilence including smallpox which killed 33% of the Arikara, 50% of the Hidatsa and 90% of the Mandan. The narrative is a bit dry compared to some of the “reads like a novel” non-fiction I’ve been reading lately and it’s not as literary as The Comanche Empire by Pekka Hämäläinen, but it’s good – clear, concise, well organized, and I enjoyed the personal road-trip asides, too. The photos and maps are enhance the narrative nicely – especially the inclusion of the photo of a boy with smallpox even if the photo is from Bangladesh in 1975 – I had no idea what smallpox looks like.